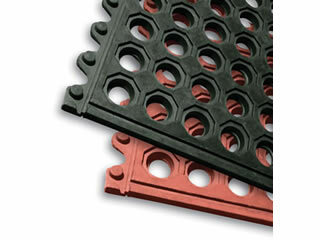 Thick rubber construction helps relieve fatigue and increase productivity. 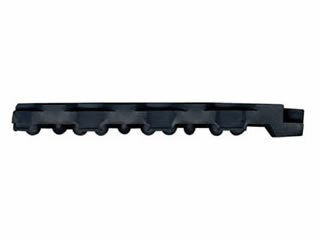 Built in interlocking connectors designed to securely connect one or more sections to cover large areas. Drainage holes allow liquid and waste to pass through matting. Modular design means smaller sections for easier handling and cleaning. Reccomended for oily, greasy industrial workstations, bar & kitchen wet areas, food processing work cells and more. Same great mat as our Performa but with a solid surface that provides a complete coverage elevated standing surface for wet work areas. 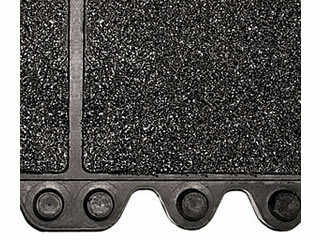 Super Tough Performa mat with durable, abrasive Gritt Tuff surface for increased traction in wet areas. 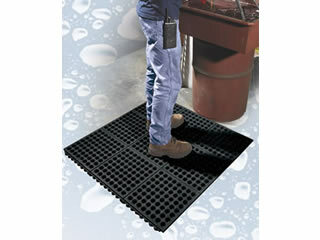 Holes in mat allow liquid to drain away from the work area. 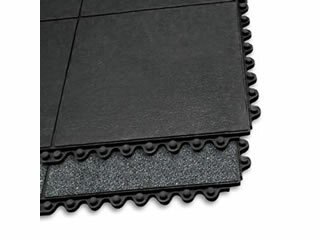 Easy to use connectors help hold mats together to easily and safely cover large areas. 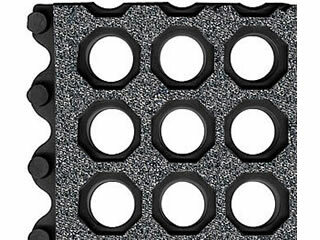 Nibs elevate mat above the surface to allow easy drainage of fluids away from the mat.